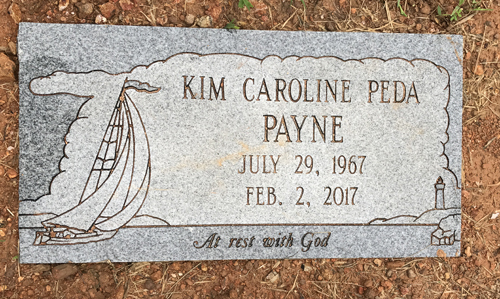 Kim Payne, 49, of Woodstock, Georgia, passed into the arms of Jesus on February 2, 2017, following a 5 year battle with cancer. Kim was born in Ft. Worth, Texas, on July 29, 1967, and attended schools in Fayetteville, North Carolina, and Atlanta, Georgia, graduating from North Springs High School in 1985. Kim worked in Medical Records and Insurance Claims for several medical practices in the Atlanta area, most recently with Dr. James Ellner of Georgia Pain Management. Kim enjoyed her work, but the roles she loved most were that of wife and mother. She especially enjoyed the great outdoors – the mountains, the beach and boating on nearby lakes with her family. Kim was preceded in death by her father, 1st Lt. Robert C. Peda, US Army, who was killed in the Vietnam War in 1968 when Kim was only 8 months old. Those left to cherish her memory are her husband of 29 years, Joseph (Joey) A. Payne, IV, and their two children, Allison Payne and Zachary Payne, all of Woodstock; her mother, Barbara S. Williamson, of Valdosta, one sister, Melanie Peda Smith, and her husband Brendan, and their children, Lauren, Tyler and Alex Medders, and McKenzie and Logan Smith of Marietta; two brothers, Dr. Cliff Peda and his wife Theresa, and their children Reo, Willow and Dawson Peda, all of St. Louis, Missouri, and Glenn DelConte and his wife Margaret of Atlanta; mother-in-law, Billie Jo Payne, of Brentwood, Tennessee; father-in-law, Joseph A. Payne, III (Polly) of Smithville, Tennessee; 4 sisters-in-law, Laura Payne of Norcross, Jenny (Tim) Mangan, Andrea (Patrick) Remke, and Katherine (Branen) Hurst. Kim is also survived by 9 nieces and nephews, Tyler, Evan and Patrick Mangan, Bailey, Will and Mae Remke, and Payne, Jack and Wren Hurst. Kim's life will be celebrated at Wildwood Baptist Church, 4801 Wade Green Road, Acworth, on Tuesday, February 7, 2017, at 1:00 PM, with Pastor Ric Cadle officiating. Burial will follow at Old Macedonia Cemetery, 298 Macedonia Road, White, Georgia. Visitation with the family will be between the hours of 6:00 – 8:00 PM, at Georgia Funeral Care, 4671 S. Main St., Acworth, GA, on Monday, February 6, 2017. In lieu of flowers, contributions may be made to St. Jude Children's Research Hospital , a charity which was so important to Kim, or to the charity of your choice in her memory. The Payne family is being cared for by Georgia Funeral Care and Cremation Services , Acworth, Georgia.